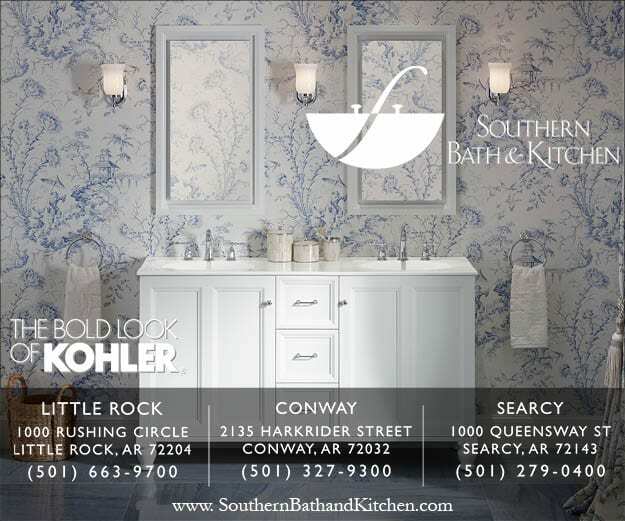 Living in the beautiful state of Arkansas provides a wonderful opportunity to enjoy and decorate our homes as the four seasons change. For me personally, I adore fall. There is something special about the crisp, morning air while enjoying a hot cup of coffee or embracing the cool nights layered with a favorite blanket. 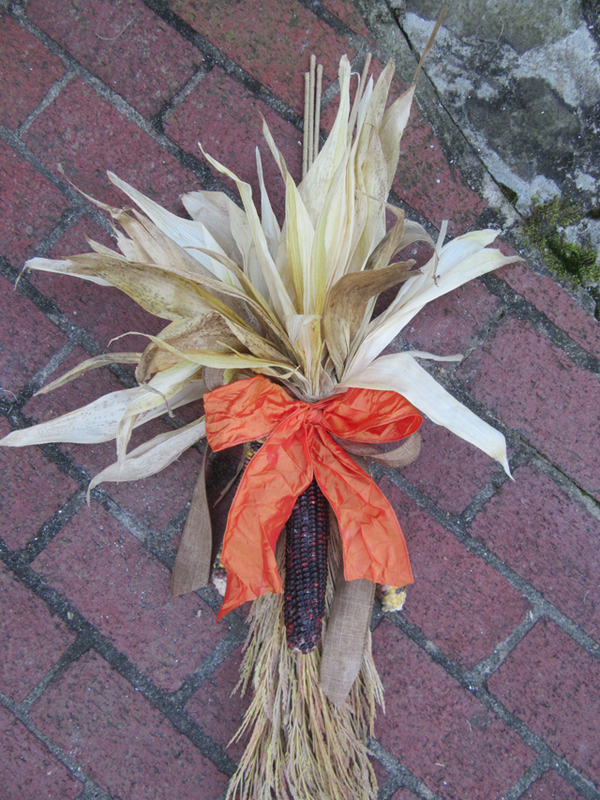 Fall’s arrival also brings forth an array of pumpkins, gourds, and colorful mums scattered among front porches. 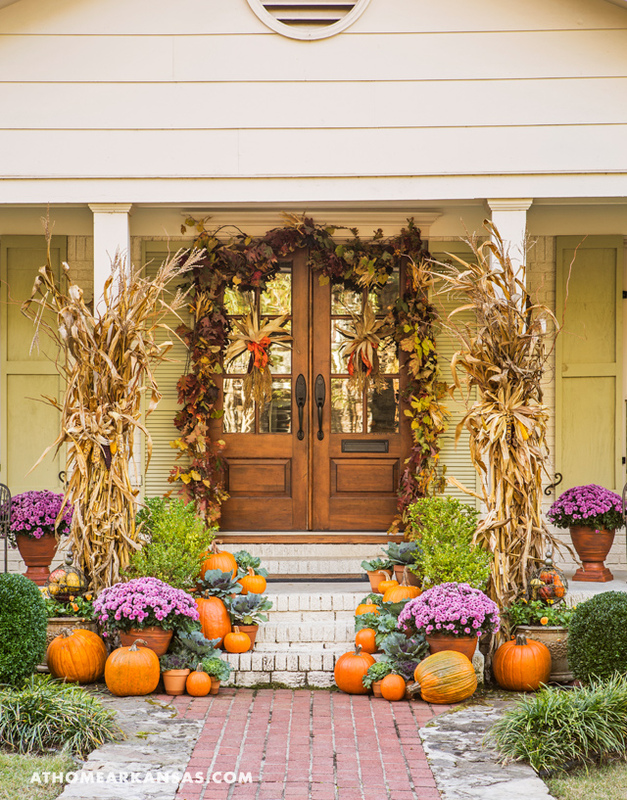 Front doors are also a fabulous backdrop for additional seasonal décor. 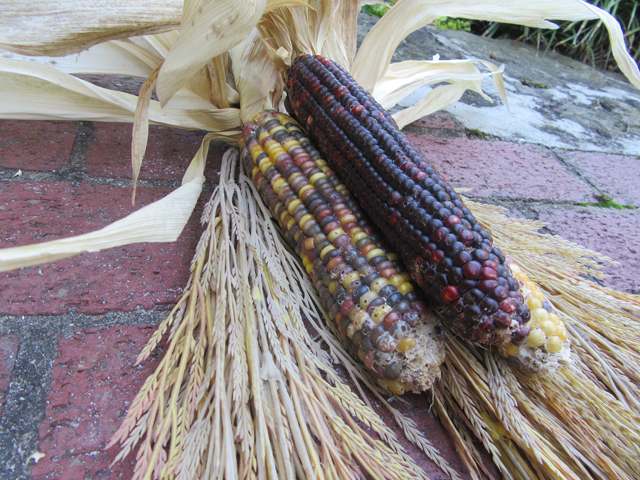 Each year, Indian corn is gathered and displayed on my front doors as a fond reminder of my childhood home’s fall decor. 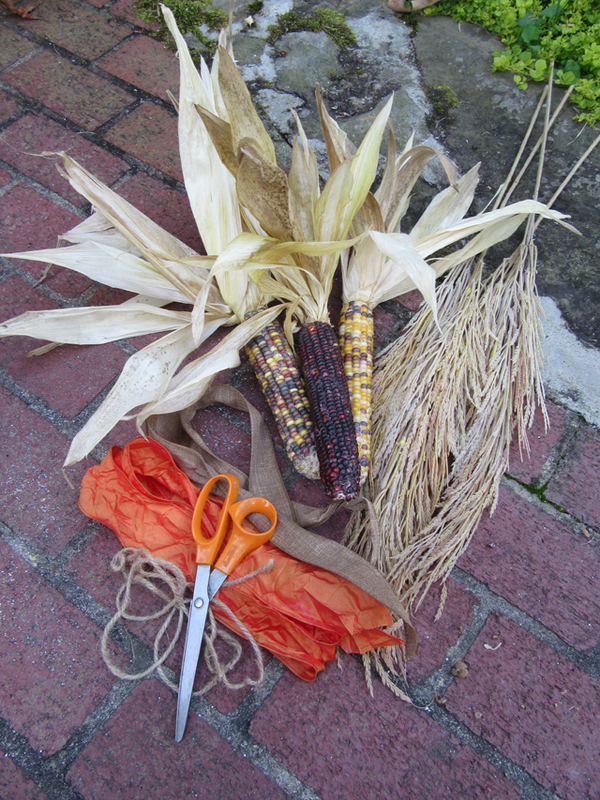 You may also create this festive display using the following items: 3 ears of Indian corn, 4 to 5 stems of wheat (I used artificial found at a local craft store), ribbon of your choice (2 varieties), twine, and scissors. 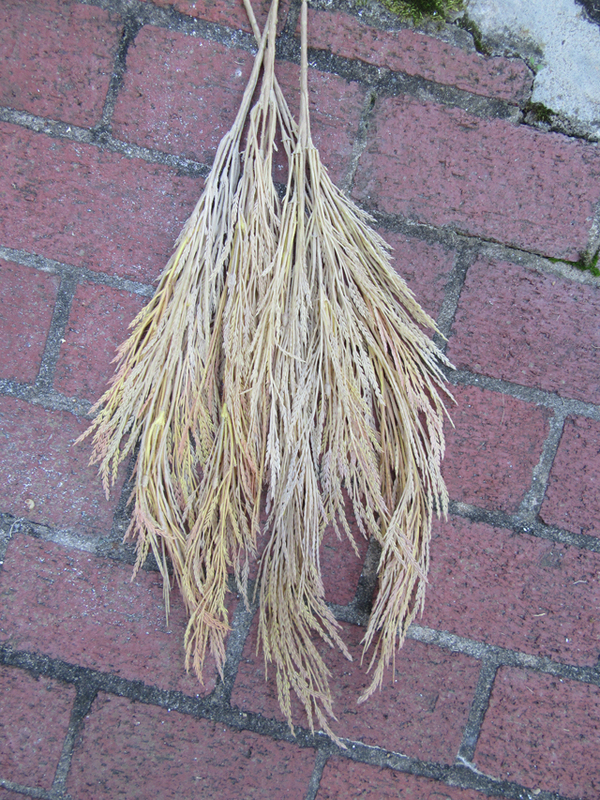 Lay 4-5 stems of wheat gathered together on a flat surface. 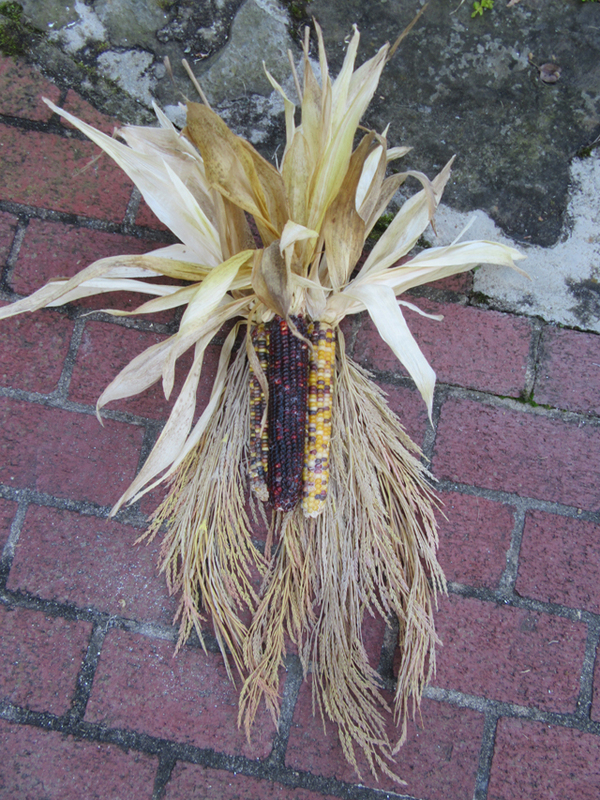 Next, fluff the husks on the corn to add dimension. 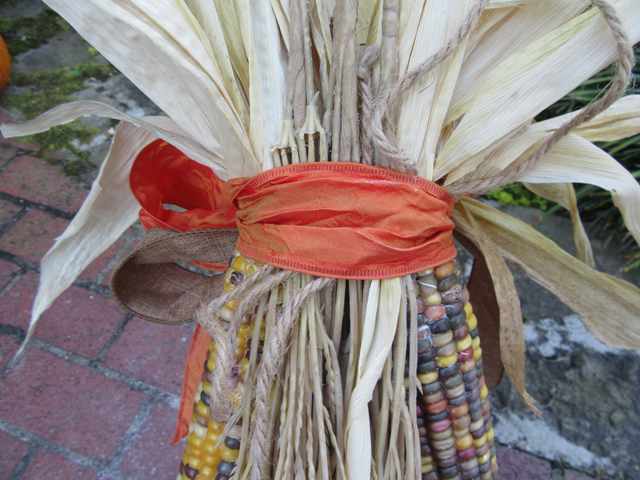 Place 3 ears of Indian corn on top of the gathered wheat. Ensure the top portion of the corn meets the gathered point of the wheat. 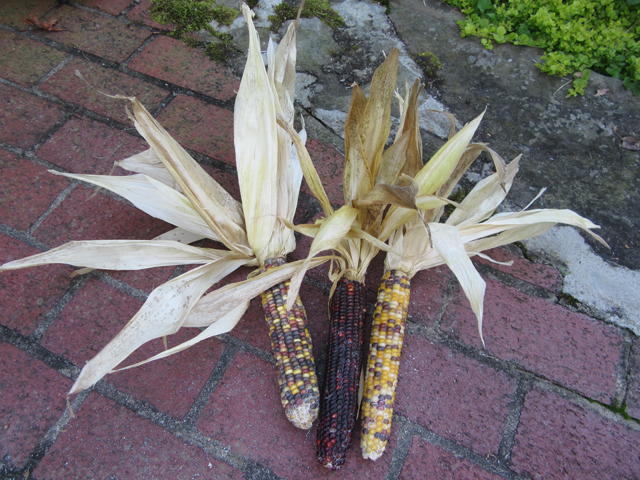 The 3 ears of Indian corn create a triangle when stacked. 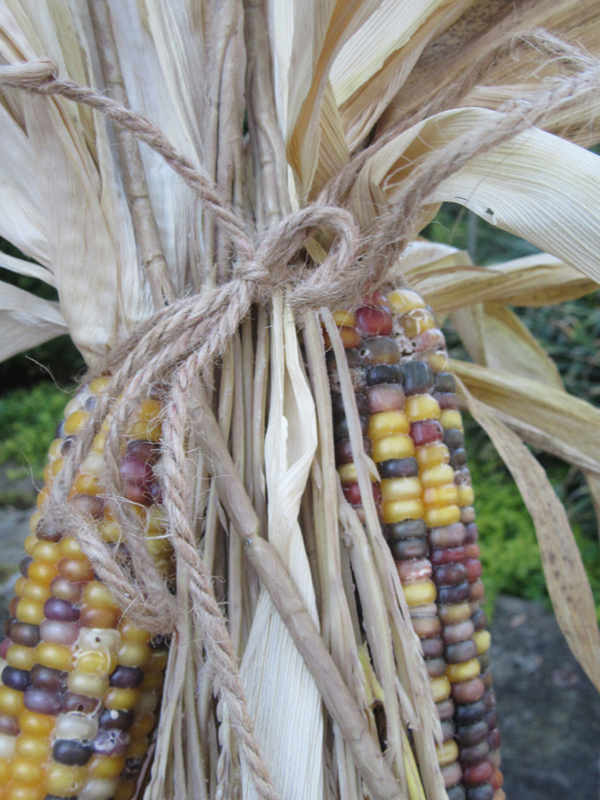 Secure the Indian corn to the wheat with a piece of twine tied on the backside. Cut a 50” piece of ribbon of your choice and tie in a bow on the front side. For a layered look with a punch of color, add another 50” piece of ribbon tied in a bow. 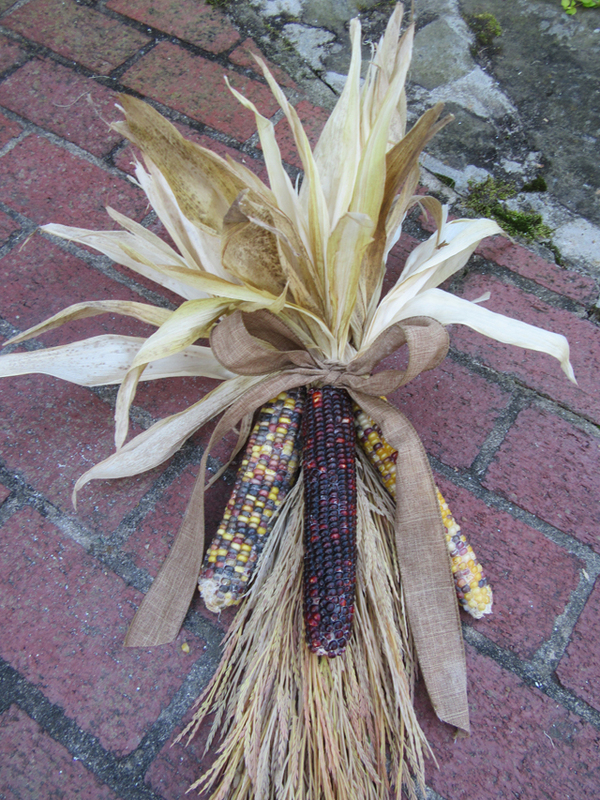 Display the Indian corn and wheat on your front door by securing the backside of the ribbon onto a brad nail hammered into your front door at an angle. 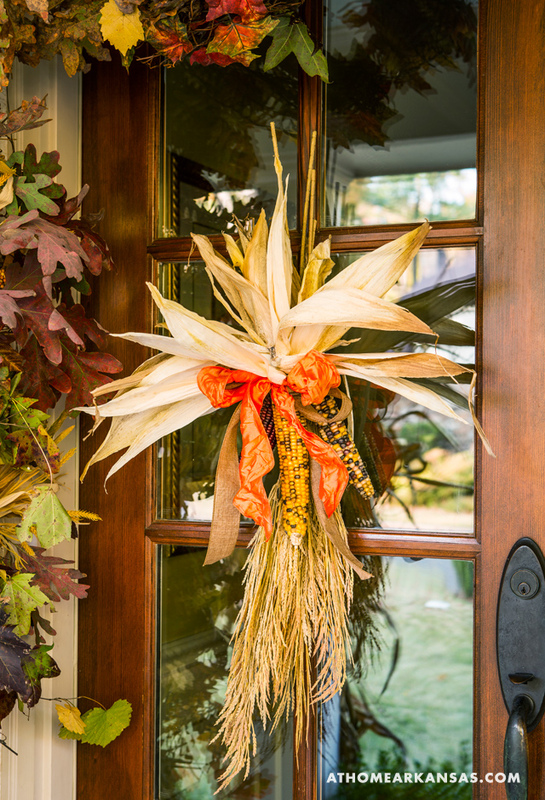 With the addition of your new Indian corn and wheat front door décor, I hope you enjoy this beautiful fall season! Learn more about Jana and view her work at janahunter.com. 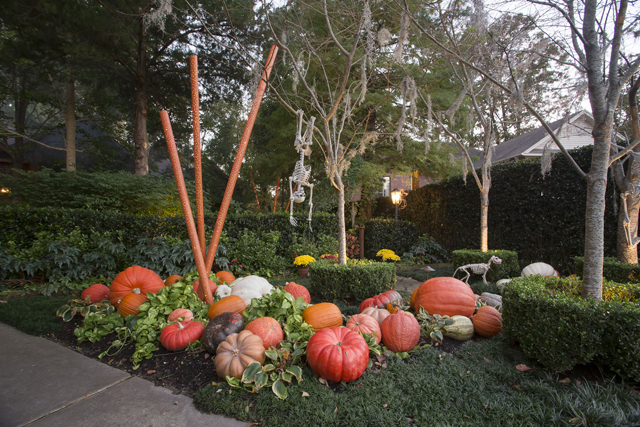 See more images of Jana Hunter’s front porch decor in the October issue, HERE. 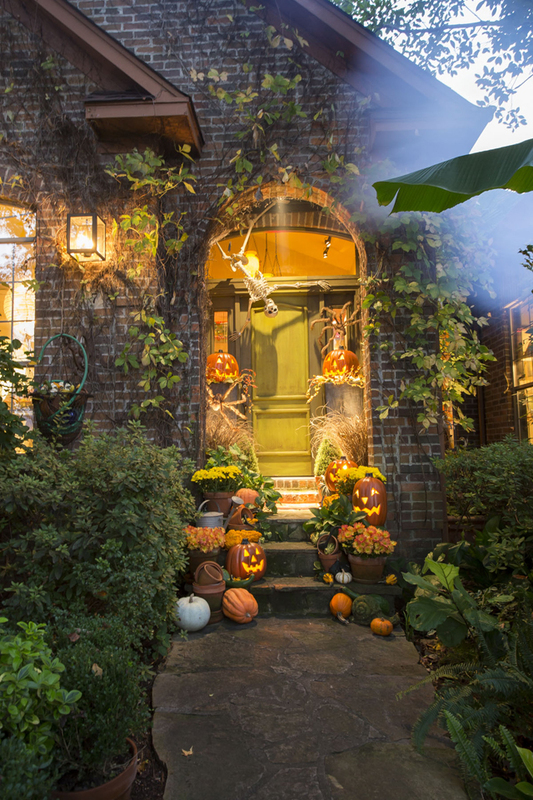 Did you know that Halloween is now becoming the top holiday for spending on decorations? Even exceeding Christmas. You have a lot of competition out there, so you might just need to up your game. We all know about creating a bit of interior spookiness, but, if you have a walk and a bit of green space, you can create shivers at the curb. You won’t need to hire a grave robber to find you some bones. Lots of really good (read: lifelike) skeletons are now available, and they’re not limited to humans, either. A great way to display a skeleton, since we’ve all seen them hanging at eye level, is to elevate it a bit and maybe splay it out. Spread out the arms and legs, as if it were tossed by something not quite human, and wire to a tree trunk, so that the head is just above your gaze. If you don’t have any slim trees in your yard like these birches, you could attach your skeleton to a wall, even, or to corner of the house. The idea is to bring it up higher to maximize the effect, and don’t just leave it relaxed and standing, as if it were hanging in an anatomy lab. 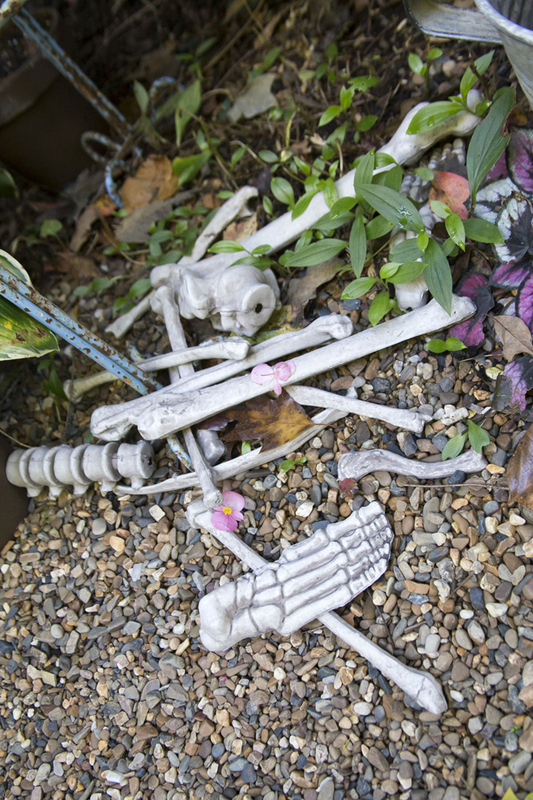 And a pile of bones is also a great way to add a further element to your design. You don’t always have to use a complete skeleton. And you might also like using animal skeletons as well. What’s great about these dogs is that they fit the scale of decorations along a walk. 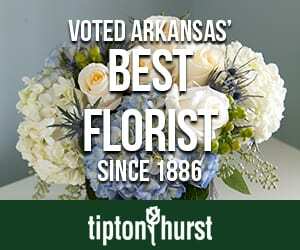 Visitors can’t miss them, and they’re unexpected. 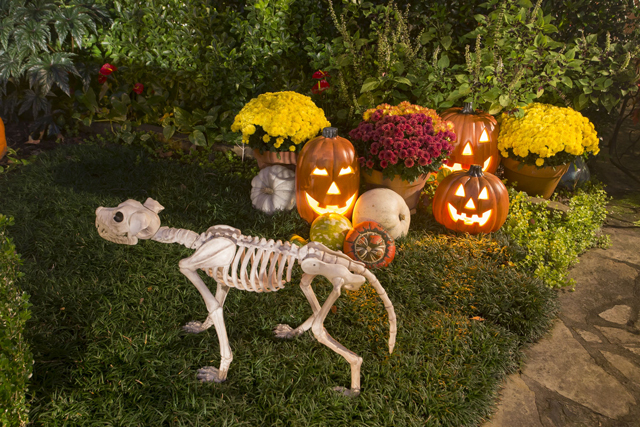 You might need to assure guests that, no, that’s not the skeleton of your retriever. If you use pumpkins, really use them. One or two will never be enough. And don’t just line them up, either. 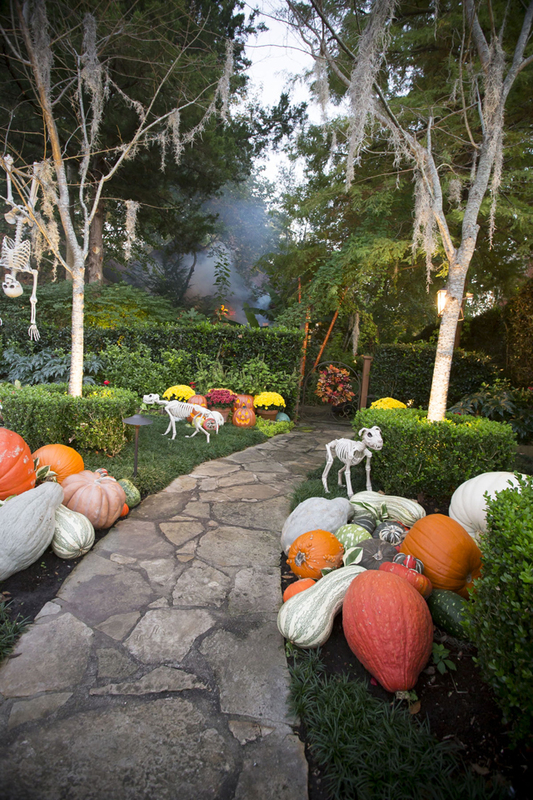 Create a feeling of bounty and texture by creating drifts of pumpkins along a walk, or on a porch. Also, a great way to use them is mix real with artificial. It’s also a good idea to mix varieties of pumpkins. Avoid using nothing but the traditional orange. 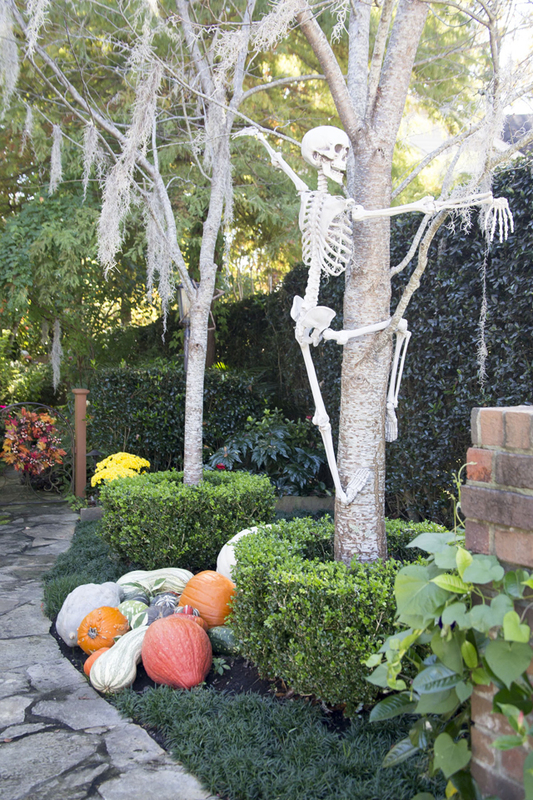 You’ll find stripes and all sorts of hues, plus the great ‘Ghost’ pumpkins, with a pallor that will punctuate your design, and echo the skeleton’s whiteness. You’ll find many fake pumpkins already ‘carved’ as jack o’ lanterns, and you can mix them in. One trick I have for making them a bit more lifelike—and even elegant—is to stain them. Take a cloth dip it into walnut stain, and wipe the entire pumpkin and stem. This action calls for a light touch; you don’t want a pumpkin that’s too dark. Once you’ve achieved your mix of pumpkins, add mums. They’ll provide a shot of color to your display. When the holiday is over, you can simply plant the mums. Another advantage they have is that they also pick up the light, which is crucial since many of your guests will see your handiwork only at night. And speaking of lighting, if you have it, use it, or even create it. The light tubes here were once PVC pipes that were drilled with random holes and then filled with strings of white lights. Just bury them and display your bones and pumpkins around this bit of impromptu light. I sprayed the tubes orange for the occasion, and I like the effect so much, I leave the lights on during the day. 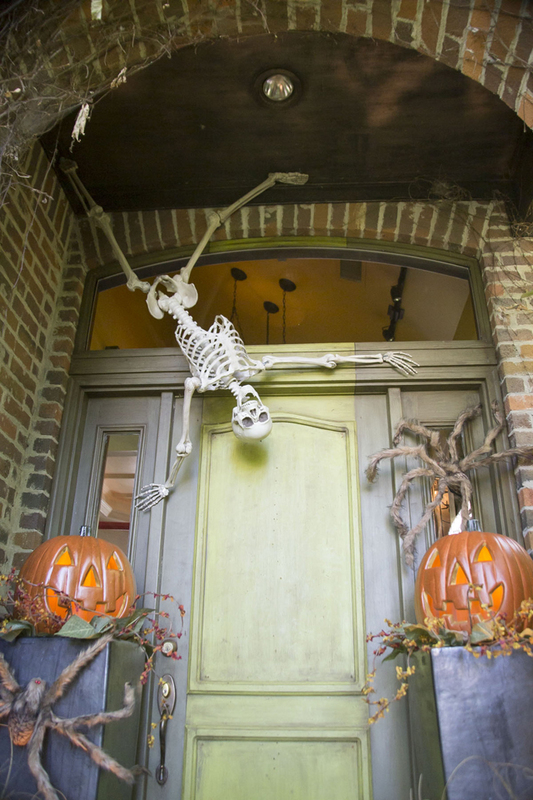 Once your skeleton is hung, you might need a bit more texture, since you’re bringing your guests’ eyes up into the trees. Instead of using the nylon cobwebs, try Spanish moss. And you won’t have to get in the car and drive to the coast to get it. You can pick up packaged moss at Botanica Gardens, and it creates a nice decrepit effect. Once you have your large pieces in, step back, appraise your work, and add elements as needed. Then add some more. 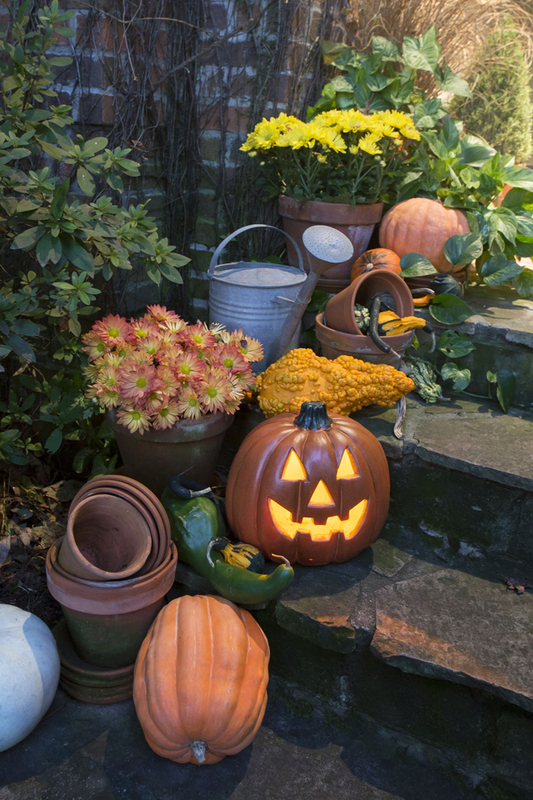 Pumpkins, jack o’ lanterns, mums, and seasonal bits like bunches of bittersweet, which you can place in groupings on the ground, and in pots along the entryway, will mean you’re really enjoying a ‘haunted’ life. Just the right thing for the season. Jerusalem Greer (of Jolly Goode Gal) comes to your rescue with inexpensive, easy Christmas crafts that are a tad bit nostalgic to boot! We love the “Too Many Mittens” reference, and the sheet music. Goes to show that, when it comes to decorating for the holidays, personal is best. Use your imagination and have fun! And if you get stuck, these tips from Jerusalem are sure to get you going. As I thought about what Christmas crafts I could share with the At Home blog readers this month, I realized that I should give the kind of gift that I love to receive: One that is personal and homespun. So for this month’s post, I thought I would share a few Christmas crafts from my own home. Not every craft I try is a winner (there was the disastrous snow globe fiasco after all), but every now and then my plan comes together, and I end up with a lovely new creation that my family and I can enjoy for many Christmasâ to come. Below are a few of these successes that are both simple (because who has time for one more complicated to-do task on their holiday list?) and lovely. To create this look, simply layer vintage Christmas cards on top of holiday themed sheet music and place in an inexpensive frame. To keep this look clean and crisp I chose a white frame, which helped set off the vintage papers without being overly fussy.  Â full. Stamp or write the words and phrases like “Snow Starter,” “White Christmas 2011,” or “Frosty R.I.P.” on a small shipping tag. Replace the string on your tag with a pipe cleaner. Fold your tag in half and place in your bottle. (If your tag doesnât pop open after you have pushed it back into your bottle, you can use a pipe cleaner to open it back up.) Next, hot glue a small to medium Christmas ball or ornament Â to the top, inverting the top of your ornament into the mouth of the bottle. Using a thin ribbon, tie a lose one knot bow around the neck of your bottle. Ta-da! A cute Christmas conversation piece. For years I was one of those people who could never find a way to display the Christmas cards our little family received that didnât look too busy or bulky. Finally, in act of desperation, I grabbed two metal wreath frames with contrasting grosgrain ribbon and went to wrapping. I wrap the ribbon around each frame. Then, using 5â flocked red ribbon, I connected the two wreaths with one simple loop. To top it all, I took another large piece of the same ribbon, ran it through the smaller wreath and knotted it, letting the tails hang down. I added a large glittered jingle bell as the final touch. To attach my holiday cards, I use stick pins and the folds of the ribbon. Maybe this year I will even add a third wreath. I have made all sorts of gifts, including nameplates as teachers gift and jewelry for my sisters as Christmas gifts. Last year during the holidays, I created my own version of a peace sign, and this year I hope to add Love, Joy and Hope to the collection. If you are going to make your own Scrabble crafts this holiday, I would suggest hitting up estate sales and flea markets for great deals on used games. However you celebrate this holiday, I wish each of you a wonderfully simple, beautiful Christmastime.